President Donald Trump's former adviser Roger Stone was arrested Friday on charges of obstruction, false statements and witness tampering, marking one of the most significant developments to date in special counsel Robert Mueller's probe into Russian election interference. But for Trump and many of his supporters, the bigger story appears to be CNN's presence at Stone's Fort Lauderdale home before the raid — and how they knew to be there to capture the footage. In a tweet Friday morning, Trump referred to the Mueller investigation as the "Greatest Witch Hunt in the History of our Country," and added, "Who alerted CNN to be there?" The president's tweet came hours after former cable news anchor Greta Van Susteren tweeted, without evidence, that the FBI had "obviously tipped off CNN" to the fact that they were going to raid Stone's house. "Even if you don't like Stone, it is curious why Mueller's office tipped off CNN instead of trying to quietly arrest Stone," she wrote. "Quiet arrests are more likely to be safe to the FBI and the person arrested." Baseless accusations and conspiratorial thinking have become a feature of American politics in the Trump era, but the implication of collusion between the FBI and CNN was, for many journalists, a bridge too far. Van Susteren was roundly criticized for her tweet by fellow reporters and former colleagues, and later corrected it. "It is not obvious that FBI tipped off CNN ... someone else could have tipped them off," she wrote. "I am not criticizing CNN for being there," she later added. "They out hustled other news orgs." By that point, however, the conspiratorial thinking had spread across social media and onto conservative media outlets, including The Daily Caller and Newsmax. Most significantly, it had been echoed by the president himself. 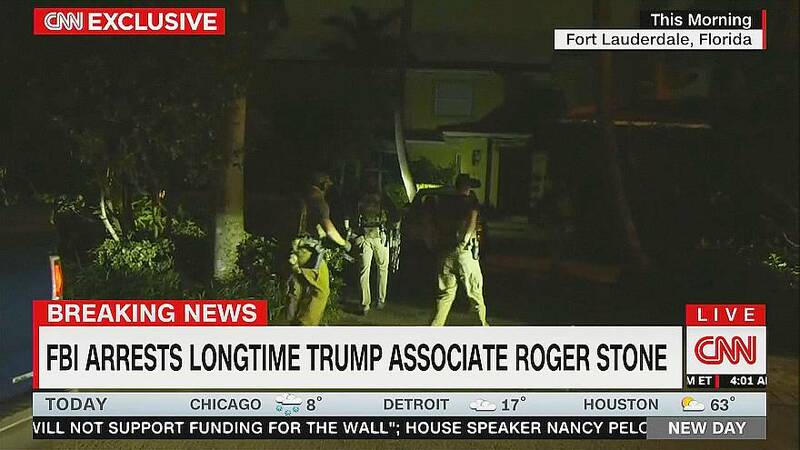 Forced to reckon with the baseless accusations, CNN issued a reply to the president via Twitter: "CNN's ability to capture the arrest of Roger Stone was the result of determined reporting and interpreting clues revealed in the course of events. That's called journalism." In a more detailed report, CNN's Jeremy Herb explained how the network's presence "was the product of good instincts, some key clues, more than a year of observing comings at the DC federal courthouse and the special counsel's office — and a little luck on the timing." CNN's detailed explanation appeared to put out the fire for anyone who isn't predisposed to pro-Trump, anti-media conspiracy theories. But as Recode co-founder and MSNBC contributor Kara Swisher noted on Twitter, the fact that they CNN had to explain it in the first place was .... "ridonkulous."